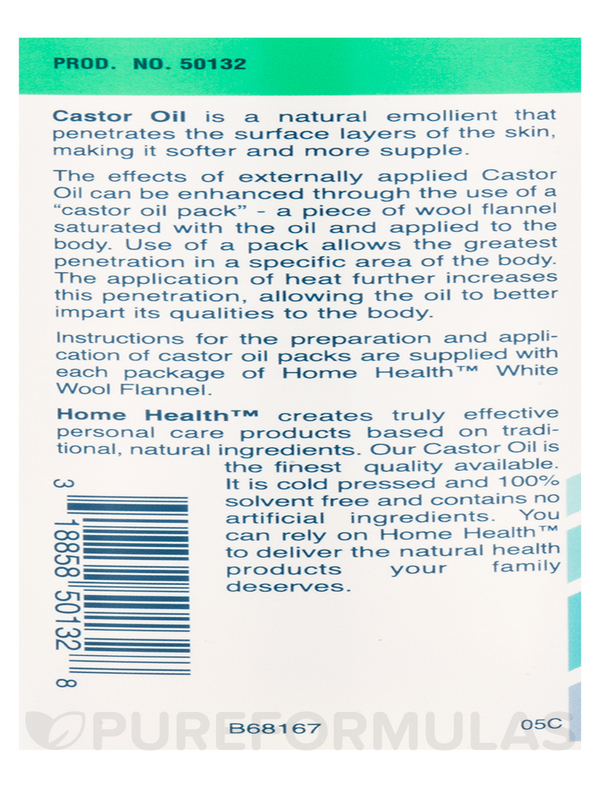 I use Castor Oil by Home Health for castor pack for wound. It works well. I use this for therapeutic reasons and as well it's great for healthier and thicker hair. I have been using Castor Oil Cold Pressed & Cold Processed for 6 months and this helps with stomach bloating. Vegan / Vegetarian / Non-GMO / Gluten-Free / No Animal Products / Not Tested on Animals. Cleanse the skin with a mild soap and water. Apply as required‚ twice per day. 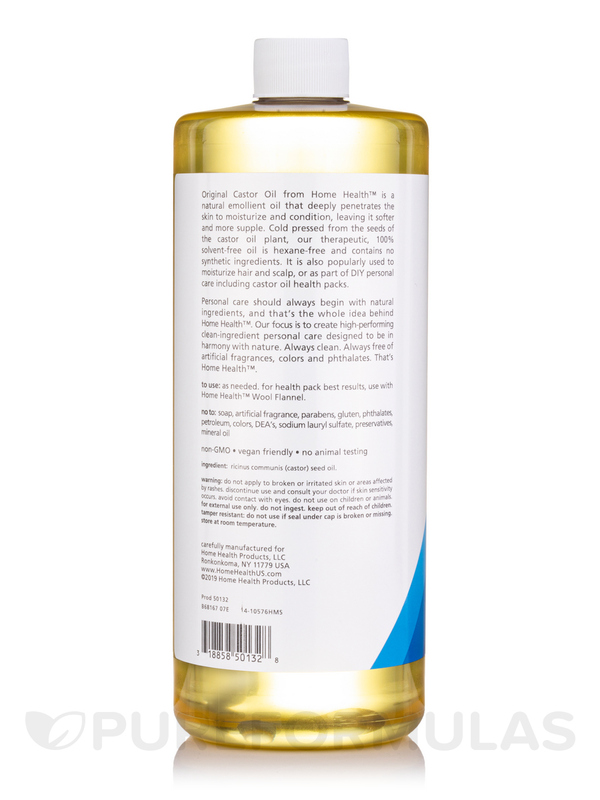 As a Castor Oil Pack for concentrated application‚ saturate wool flannel and apply over desired area. Dry heat may be applied. So many uses! It's great. Good quality for the best price I've found. Big bottle. Great price. Many uses. Cannot do without Castor Oil! I use generous amounts externally whenever I get a bump or potential bruise or when arthritis twinges occur. Potential big pains become trivial. 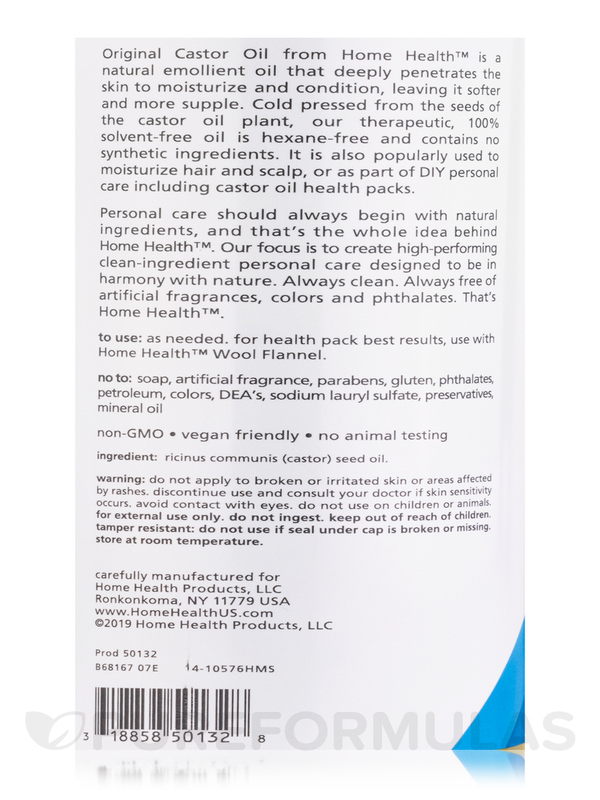 Also helps with curing infection if coupled with a soak in hot Epson Salts to draw, Goldenseal applied afterwards, then a light layer of castor oil to lubricate skin. I like EVERYTHING and recommend castor oil to all my friends. It can be messy, but there is so much to benefit, its worth far exceeds the mess. High quality. Fast shipping. I use this oil as a moisturizer (added some rose and myrth for nice smell) as, i believe, it does not clog skin; also for massages, and for medicinal purposes. This is a great anti-inflammatory oil. Great product and lasts a long time! 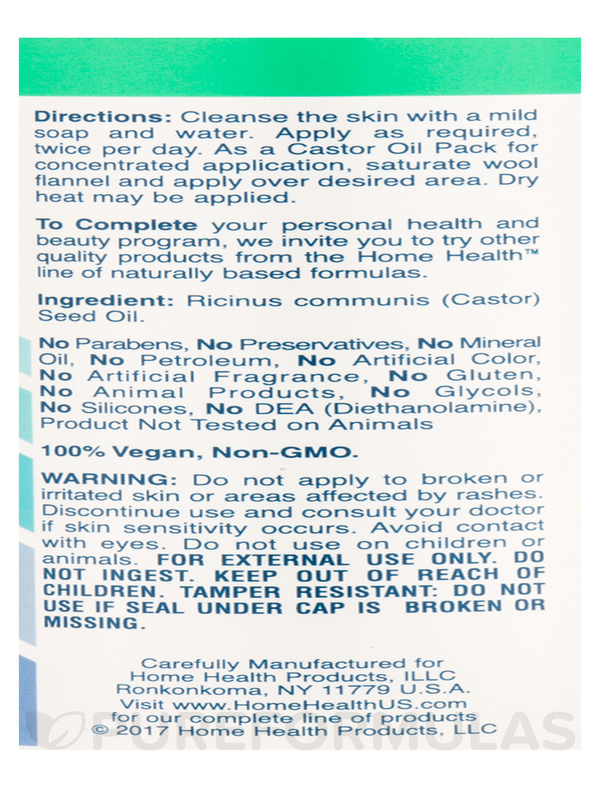 This Castor Oil by Home Health works great for castor oil packs. I bought a much smaller container last time and this big one was a good buy! 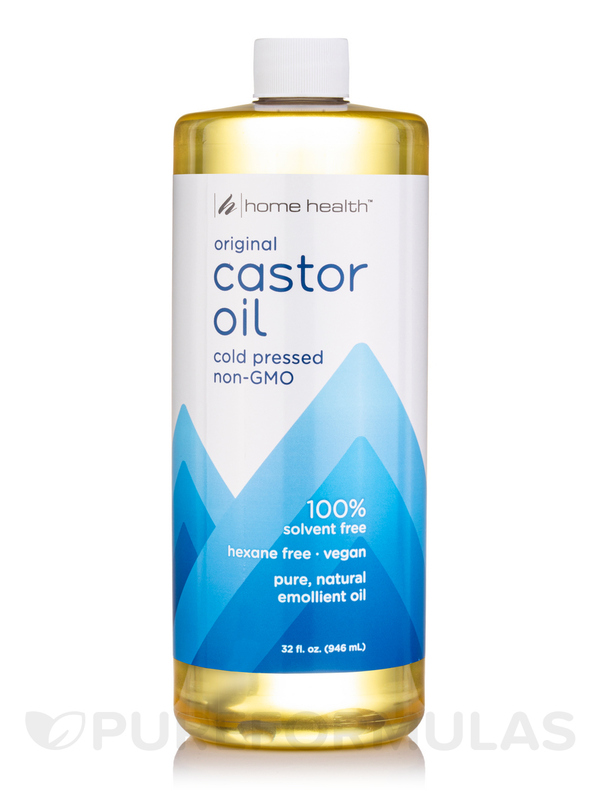 Bought Castor Oil by Home Health to use as a carrier oil, it takes a long time to soak in, moisturizes great but not ideal as a carrier oil. Does not soak in well on wet skin. Castor Oil by Home Health works well for hair and skin but I think the black castor oil provided a bit better results for my hair than this one (that's just me however). But the container lasts a good while. I love adding Castor Oil Cold Pressed & Cold Processed by Home Health to my homemade liquid soaps because it creates big beautiful bubbles.